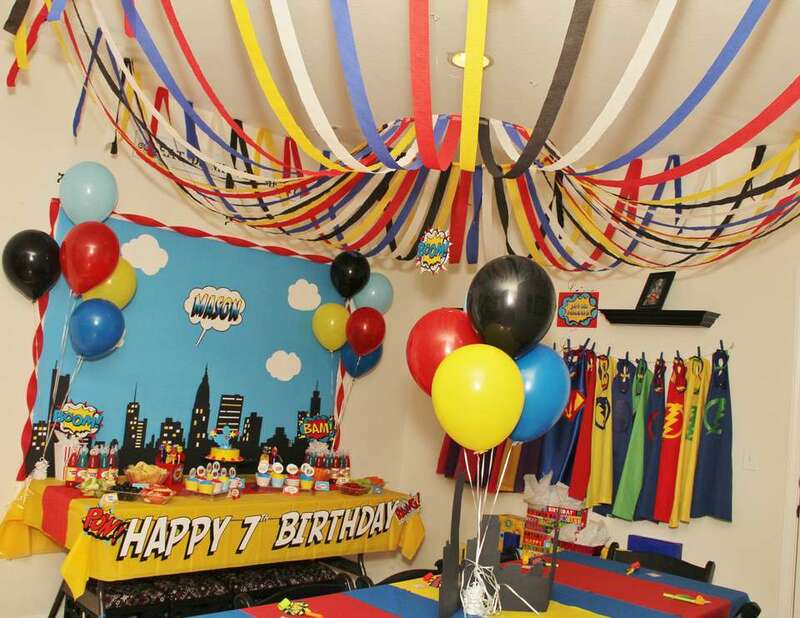 My son Mason turned 7 and requested a superhero party! So I cruised Pinterest and collected party ideas and came up with what you see here. I have lots of printable that I am willing to share if anyone is interested! I made all the capes and masks myself! Bags were purchased on Oriental Trading. I would love your printables if you don't mind! What's your email address? I can send you what I've got! Hello, would you mind sending me printables as well. Marybun020@yahoo.com Thank you... N also where did you get your capes and mask. I would love a copy of your printable a as well. Bbreinholt@gmail.com. 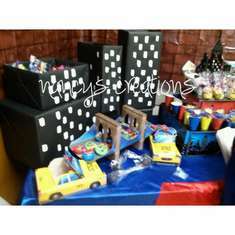 Super cute party! What a fantastic party - If you would share your printables, I would be very grateful! cabsguard@yahoo.com. Where did you get the capes and masks? Hi. What a great party. Love the phone booth! Could you share your printables? Thanks a ton. heatherburen@sbcglobal.net Did you buy the capes and masks? hello, I am making my son's party man of iron and I would ask your pictures can send me? aline.daiana @ hotmail.com I will be very grateful. Hello, I am trying to plan my son's birthday party and would love if you could send me some printables. My email is tu.jennifer@hotmail.com THank you! This would be my 5year olds dream party. Can I also receive the printable? Brockelly24@hotmail.com Thanks! This looks great! Can you please send me the pro tables? My email is lauraloggins23@gmail.com. Thank you in advance. Such a cute party! We're planning one soon, and I'm searching for ideas. I found this on pinterest. If you could send me your printables, I'd really appreciate it! My email is: queen_bee101@hotmail.com Thanks! Hi Amanda! I love your party details. Can you please send me your printables. My son's name is Mason too. I am throwing him a Super Hero party in a couple months for his 1st birthday. Anything you send will be highly appreciated. My email address is marciec.williams@gmail.com. Thanks! I loved this party!! Would you be willing to send me your printables? 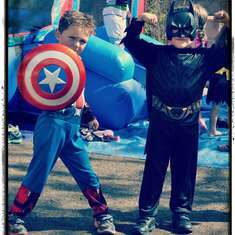 My son's superhero party is March 9th! After seeing you're party I'm pretty excited! I also purchased those candy buckets from oriental trading! Olivia P- what's your email? Hi Amanda, Can you please send me your printables? My email is kyles_10@hotmail.com They look amazing! you did a fantastic job! Great Party! Could you please send me your printable for my son's 6th birthday! My email is rec0211@yahoo.com Thanks! Your party looks amazing!! Would you mind sending me the printables? 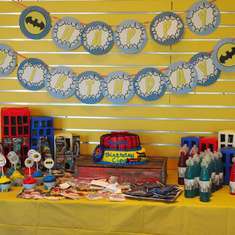 I'm having a Super Hero party for my son! My e-mail is: pennstategirl2007@gmail.com Thanks SO much!!! If you're still able to send the printables, could you send them to me at ajfry1@hotmail.com Thanks! Hi there could you please send me the pintables as well? my E-mail is 'mariabibian21@yahoo.com"
Hi where did you get the blue backround? If you are still able to share the printable, could you please send them to me at kristindiefes@yahoo.com? I would greatly appreciate it as my son is turning 4 at the end of the month and he would be so thrilled with this theme!! I would also love to have a copy of your printables. 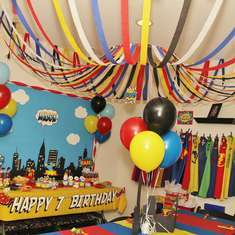 My son and daughter will be having a double superhero birthday bash very soon. Please send it to my email celinelafuente@hotmail.com. Thanks so much! Hi, I know it's been a while, but do you remember where you got the city skyline backdrop?